Community Sport: What are Transferable Methodologies and Approaches? The 2016 Olympics in Rio has generated terrific event in the Greater Boston area, like the one I attended yesterday with guest speakers such as Ellen Minzer, World Champion rower and award-winning coach. From her experience at elite levels of rowing and more recently as a coach to athletes with disabilities preparing for the Paralympics in Rio, Coach Minzer highlighted the importance of social inclusion in sport. Among Coach Minzer, many coaching roles she serves as the Director of Outreach with Community Rowing Inc a sport-based youth development program based in Boston. In listening to Coach Minzer presentation, I began to see linkages in the aspirations of what Kidsquash was striving for in Boston and Khelshala in India. Comparisons can be made in community sport – such as rowing and squash – though executed differently by athletes during competition. Squash is mostly an individual sport in that during competition on the court it is one versus one, although there are team events too such as doubles squash with two versus two. Rowing is more of a team sport although there can be events with single sculling. The question for program directors of sport-based youth development programs from different community sports becomes what best practice in coaching rowing can be applied to squash or vice versa? What coaching methodologies do coaches use with differently aged and abled athletes? What coaching philosophies or approaches can program directors help to implement? These questions have societal consequences for all stakeholders in sport and beyond. This is why it is important to create more qualified coaches such as Coach Minzer who gives back to the sport, no matter what the level of the athletes, as they can help raise standards in community sport practice and participation. The Institute of Athletic Coach Education at Boston University is a fantastic resource for program directors and coaches to begin or enhance their professional development with sport-based youth development programs. Over the past few days, I was fortunate to attend the 3rd International Forum on Sport for Peace and Development at the United Nations Headquarters in New York. United Nations Secretary General Ban Ki-Moon and the Dr. Jacques Rogge, President of the International Olympic Committee led the opening session of the Forum. Here is the official UN press release. 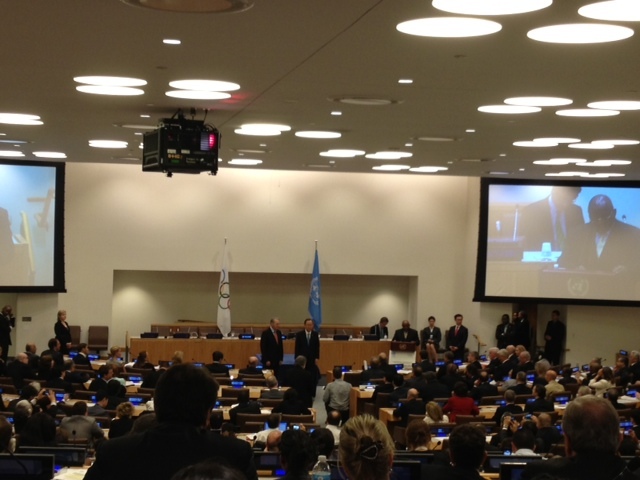 UN Secretary General Ban Ki-Moon and Dr. Jacques Rogge, President of the International Olympic Committee leading the opening session. As a member of the International Sport for Development and Peace Association, I attended the forum to represent Khelshala (India) and Kidsquash (USA) to learn, connect and collaborate with others working in the field of sport for development and peace. An informal meeting of practitioners, researchers and educators provided an opportunity for networking as well as an avenue for sharing updates on university programs, research and sport-based youth development initiatives. There were several references made by Mr. Wilfred Lemke, UN Special Advisor on Sport, on the role of volunteerism in sport as a means to activate young people. As a former United Nations Volunteer, I believe this would be a valuable experience for aspiring development professionals. Thanks to the organizers of the event it was an opportunity to learn from the nuances in high-level, policy discussions as well as be at the forefront to mainstream sport-for development programming in the United Nations systems and beyond. 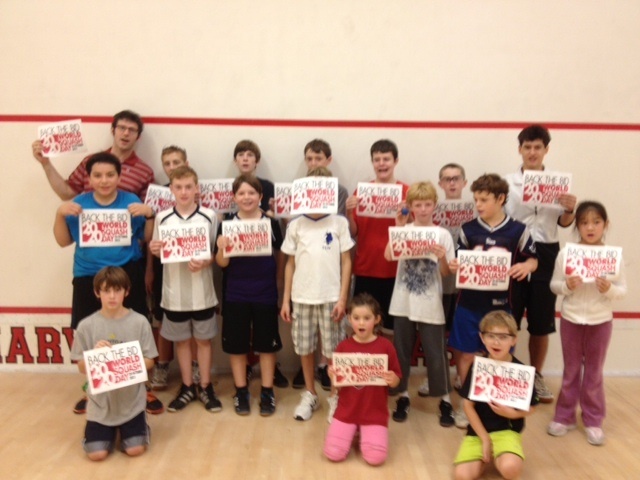 In honor of the 2012 World Squash Day, we celebrated by kicking off the 2012-13 Kidsquash season with 15 juniors just beginning their foray into the great game of squash. Lead Coach Luke Hammond, a former coach at SquashBusters along with Octavio Chiesa, a former Kidsquash participant who has returned to volunteer coach this season both brought their energy and enthusiasm to give the beginners a good start. 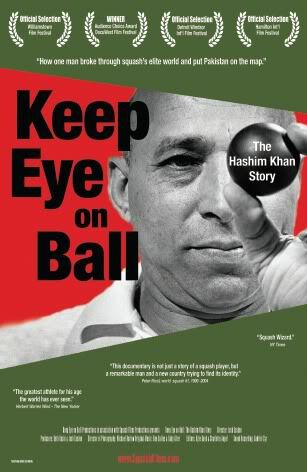 Later in the evening, I returned to Concord Academy to screen the documentary film called “Keep Eye on Ball: The Hashim Khan Story.” It was an educational experience for Concord Academy students to learn about the legacy of the Khan dynasty as well as the historical origins of squash and how the sport emerged. At Concord Academy, my predecessor was Enamullah Khan, an accomplished squash coach and member of the Khan dynasty. Even though the numbers of participants for both events were low they did play a part in shaping the bigger picture. Today over 20,000 squash players mobilized across the world to back the bid for inclusion of squash into the 2020 Olympics. Hopefully the International Olympic Committee will respond favorably to this campaign to rightfully include a truly global sport.